Looking for the perfect Valentine’s treat? 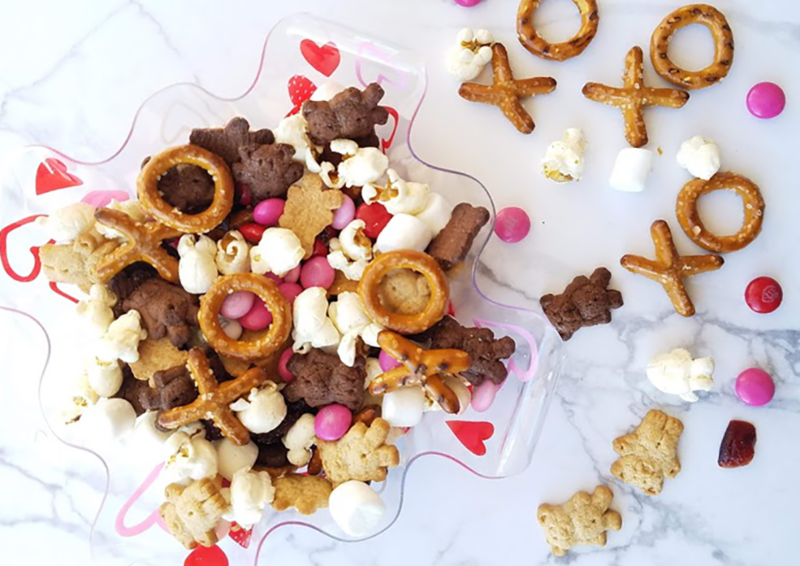 “Beary” Sweet Valentine’s Snack Mix is sure to be a crowd-pleaser for children and adults alike. The snack mix is simple and easy to make! Add ingredients to large bowl. Stir to combine. For class party, measure ½ cup snack mix into snack bag or serve for a large group in bowl with serving spoon. Per Serving (1/2 cup snack mix): 112 calories, 27 calories from fat, 3g fat, 1.2g saturated fat, 0g trans fat, 0.7mg cholesterol, 136mg sodium, 21g total carbohydrates, 1g dietary fiber, 11g sugars, 1g protein, 7.6mg Potassium. You might also enjoy these non-candy Valentine’s ideas and FREE printables.